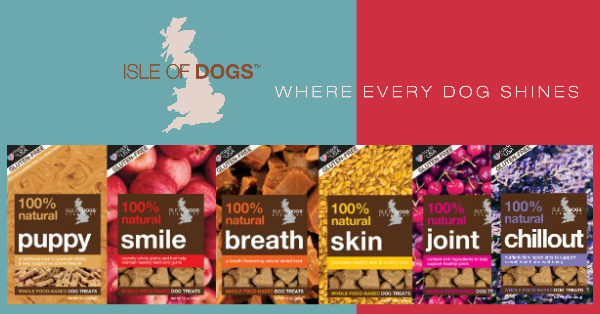 Smile 100 % Natural Baked Treat: Featuring Apples and Kelp We all want our dogs to have healthy teeth and gums, and Smile Treats are designed with that in mind. These crunchy baked treats help support oral health with a texture that helps scrub tartar off teeth. All ingredients obtained from whole food sources including grains, fruits, vegetables and herbs. Breath 100% Natural Baked Treat: Featuring Parsley and Toffee Freshen bad breath with parsley and all-natural Toffee flavor extract, developed specifically to linger on the palate. Healthy whole grains, apples, sweet potatoes, and whole flax seeds make each bite flavorful and nutritious. 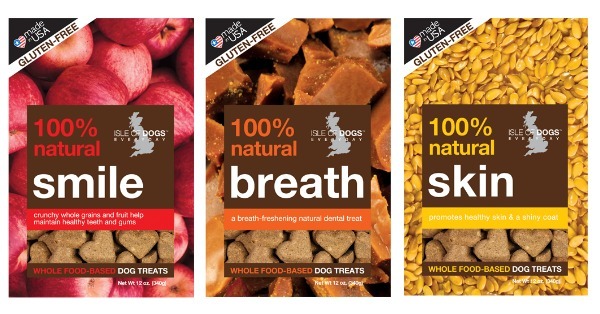 As with all Isle of Dogs treats, these are made in the USA with NO synthetic vitamins, fillers, or additives…so you can breathe easy giving them to your dog. Skin 100% Natural Baked Treat: Featuring Flax Seeds and Kiwi Fruit Designed to promote healthy skin and a shiny coat, these treats combine cwhole flax-seeds with kiwi fruit plus carrot and apple to give your dog all the benefits of a farm-fresh diet. Rich in nutrients, these treats are a great place to start if your dog has itchy, dry or flaky skin. Chillout – 100% Natural Baked Treat: Featuring Lavender & Lemon Balm Recommended for dogs with separation anxiety and tensions caused by changes in daily routines. Also helpful for calming your dog while travelling and during thunderstorms. Vanilla, lemon balm, and lavender extract are baked into each treat to help calm and relieve the stresses in your dog’s life. Puppy 100% Natural Baked Treat: Featuring Peanut Butter and Protein Puppies have special needs and these treats are designed to help support their healthy growth and development. A tasty blend of peanut butter, flaxseed, whole rolled oats, and peas to help support a healthy puppy lifestyle, promote vitality and growth. Power-packed with easily digestible vegetable proteins (approximately 35% more than any of the other functional Isle of Dog treats). 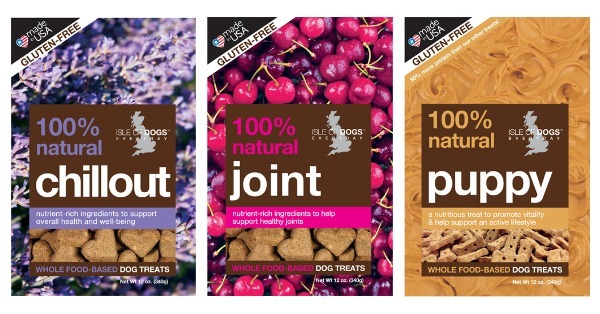 Joint 100% Natural Baked Treat: Featuring Glucosamine and Chondroitin Runners and athletes may already be familiar with Glucosamine and Chondroitin, which help support joint and bone health and reduce inflammation within the joints. Perfect for older dogs, active dogs, big dogs or any dogs prone to joint troubles, these treats are also rich in antioxidants with a delicious blend of cherries, apples, flaxseed, and whole rolled oats. Training Soft & Chewy Dog Treat: Featuring Apples & Calcium Training treats are great to use as a reward, encouragement, or just simply to spoil your dog. 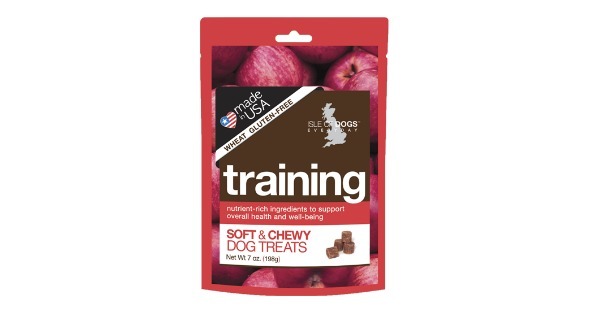 These Isle of Dogs training treats are nutrient-rich with apples, blueberries, and cherries for overall health, plus kelp and parsley to help support the digestive system. Perfect as an all-around dog treat, or as positive reinforcement during training, classes or competition. Along with treats for inner wellness, Isle of Dog also has a full line of natural grooming products to support your dog’s outer beauty as well. Visit the Isle of Dogs website to learn more. 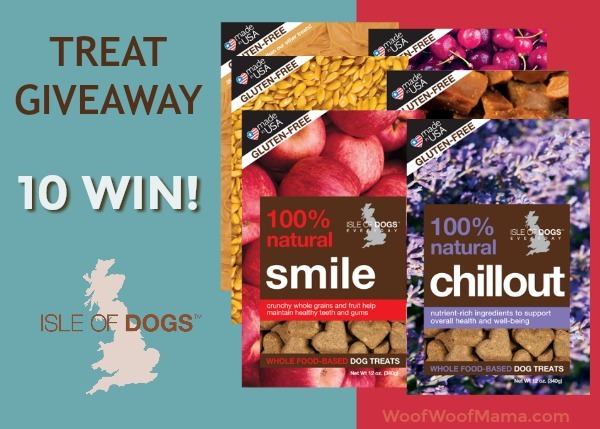 10 lucky winners will be randomly selected from all valid entries, and each will receive their choice of one bag of Isle of Dog Treats from the varieties highlighted above. Enter using the Rafflecopter contest widget below. Giveaway is open to US residents, age 18+ and ends at 11:59pm ET on 8/31/16. Good Luck everybody! well, i could really use all of them, but i think i would choose the chill out to give the girls when i leave the house, so i wont come home to a mess. these would also be good for my oldest since she has some anxiety when i am not around. she is almost blind, deaf and has a little dementia. All of these treats look great, but my little dog would need skin, smile, or breath. She gets dry spots with seasonal allergies. And even though I give her bully sticks and brush her teeth, she will get stinky breath at times. My pack is aging and now have aches and pains. The joint variety would probably make them smile. Training is always good for us!! Joint would be the best for my dogs. Well, I have three rescued Treeing Walker Coonhounds who are in the 6-7 year old range. Kenji, Kyoko, and Seiji could all use the Training, Breath, and Smile treats. Kyoko would also benefit from the Joint one, too. Probably also the Skin. Actually and and all of these would have benefit for my dogs (except perhaps the Puppy ones, but in time I’m sure we’ll have another younger dog). I think my dogs could use the Chillout treats! We would love to try the apple training treats. They love apples so much that they pick them off my apple tree all the time! Chill Out – sometimes I need him to! Preston would love to try these! We’ve tried the chillout ones and they are great. I’d probably want to try the skin ones. I have 3 dogs. My Red Boy is getting old. He could use Smile,skin,and joint treats. My little Cujo is having problems with his spin. I would love to try the joint for him. I foster Pugs and they always seem to have some kind of skin issue! therefore I would love the skin formula treats! I think I’d choose the “Smile” treats for dental health since my dog is a young adult (2) and is a small breed. I would like to try the chill out for my youngest. He is 2 years old and very hyper. Oh I would love to try the Skin! Our elderly lab has some skin issues, and I would love to see how these work for him! My dogs would benefit from joint treats because Kouga is 10 and Artie is 6.